Results from microbiological water analysis of various boreholes in Harare have shown that some of the boreholes in Harare have cholera causing bacteria in them. 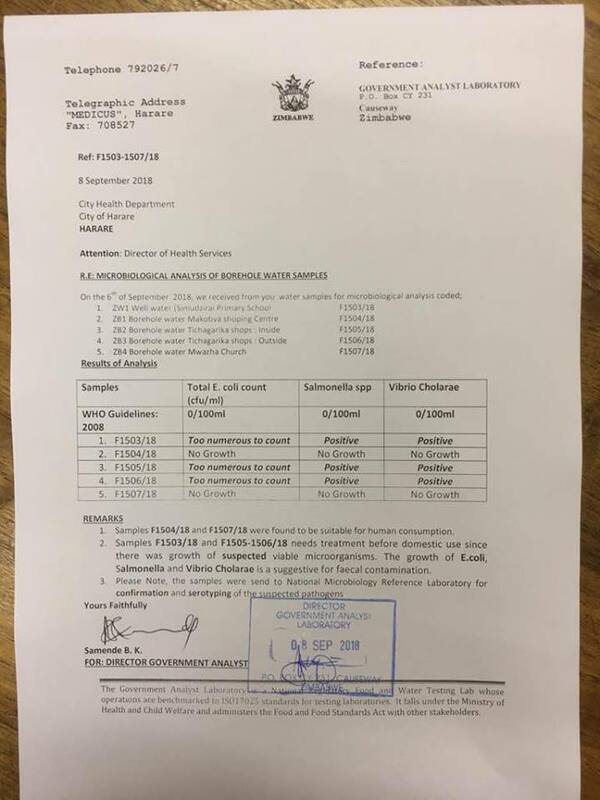 A lab report for 5 boreholes taken around Glen View shows that 3 in 5 of the boreholes contain Salmonella which is causes typhoid fever and the same boreholes also contain Vibrio Cholarae which causes cholera. This comes at the backdrop of a confirmed cholera deaths in Harare. The death toll has since risen to 10 in the past weeks with suspected incidences reported to have been 434 since September 2017. Senior government officials including President Munangagwa have not made any substantive statements regarding the outbreak which is likely to worsen given the dire economic challenges that Zimbabwe is facing. Healthcare officials have been going around alerting people on basic hygienic methods to counter the spread of both typhoid and cholera. Harare City Council has since created a Cholera Treatment Center at Beatrice Infectious Diseases Hospital which as of today has admitted about 80 patients. The isolation of cholera in borehole water presents a major health headache for the city which has been struggling to provide consistent supply of clean water to its ever increasing population.